Perfect for tuning into your favourite books on the move, our fantastic collection of Kobo eReaders are lightweight, compact and innovative. 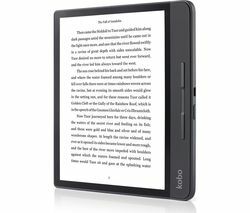 Within this range, you will find a great choice of Kobo eReaders including the Kobo Aura 2 6" eReader - 4 GB, the Kobo Aura ONE 7.8" eReader and the Kobo Aura H2O 6.8" eReader - 4 GB. Of course, the Kobo eReader that is right for you will depend on your individual requirements. Featuring a whole host of core functions including an E-ink screen, Wi-Fi connectivity, the ability to hold thousands of books and a battery life of up to 8 weeks, enjoying your favourite books at home or on the move has never been so easy or convenient. 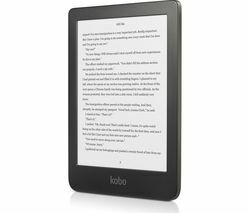 One of the most popular items within this range is the Kobo Aura ONE 7.8" eReader. Offering 8GB of storage, a 7.8 inch digital ink touchscreen, Wi-Fi connectivity and up to 4 weeks of battery life, this Kobo eReader is also waterproof inside and out making it perfect for enjoying your favourite book in the tub, by the swimming pool on holiday or at the beach. Designed to make reading easy and enjoyable, this Kobo eReader also features a ComfortLight Pro which is set up to significantly reduce blue light during the night. This means you will be able to enjoy reading your way. And with its built-in OverDrive you will be able to borrow books quickly and easily without it costing the earth. And if you can’t find a Kobo eReader that takes your fancy, don’t worry. We also provide lots of other eReader options from some of the industry’s leading brand names including Kindle and Amazon. You can view amazon kindle readers and view our range of tablets online now. Of course, if you have any questions about any of our products, please do not hesitate to get in touch.